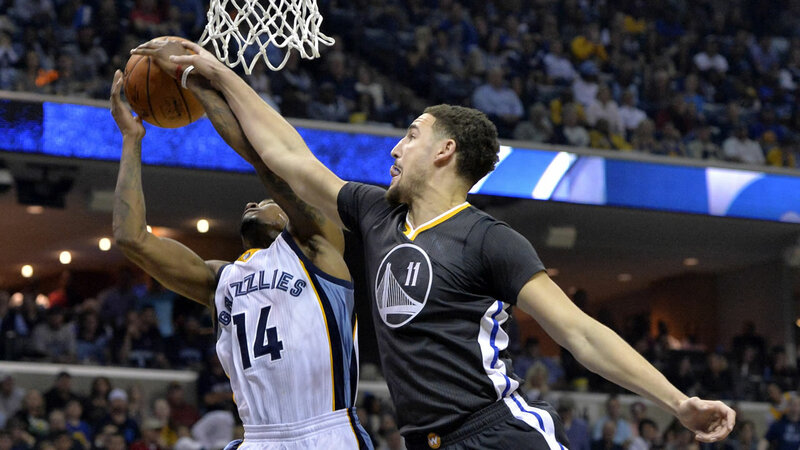 MEMPHIS, Tenn. -- One record matched, one more to go for the Golden State Warriors. Draymond Green scored on a tip-in in with 1 minute left, and the Warriors rallied from 10 points down early in the fourth quarter and beat the Memphis Grizzlies 100-99 on Saturday night to tie at least one NBA record held by the 1995-96 Michael Jordan-led Chicago Bulls. Golden State now has 33 road wins, tying those Bulls, who went 33-8 away from Chicago. The Warriors (71-9) visit the Spurs on Sunday night, and their next win will tie the Bulls' NBA single-season record of 72 victories - but the Warriors have lost 33 straight in San Antonio. Green finished with 23 points and grabbed 11 rebounds, Klay Thompson had 20 points, Stephen Curry 17 and Harrison Barnes 14 for the Warriors. Memphis' Lance Stephenson missed two shots in the final seconds on a drive and again on a flip toward the basket. Officials reviewed the play and gave the ball to the Warriors with 0.8 seconds to finish off the comeback. Matt Barnes scored 24 points and grabbed 15 rebounds for Memphis, Vince Carter added 15 and Stephenson finished 13. Zach Randolph had 12 but was 6 of 19, part of Memphis shooting 39 percent. Memphis didn't make it easy in a game with 18 lead changes and 13 ties. The Warriors trailed 90-80 when they went on an 18-7 run to take the lead back at 98-97 on a 3-pointer by Barnes with 1:40 left to set up a tense finish. Officials reviewed Green's tip-in after it initially was ruled basket interference. The Grizzlies already lost their first two games in this series this season losing by 50 at Golden State and by 16 on this court in November. This time, they played without three starters from the squad that lost the Western Conference semifinals to Golden State last spring. Memphis used an 18-5 run in the third quarter to take a 74-65 lead with 1:38 left on a 3-pointer by Xavier Munford, recently signed for the rest of the season after his second 10-day contract expired. The Grizzlies led 78-67 at the end of the quarter and led by as much as 10 early in the fourth quarter. Farmar hit a 3 with 8:24 left to match that lead at 86-76 with 8:24 to go. Neither of the "Splash Brothers" had a 3 until Thompson knocked down his first with 2:45 left in the second quarter. He and Curry combined to miss their first six 3s, and Curry missed his first five before finally knocking down a 3 with 7:36 left in the third, putting Golden State up 60-56. Coach Steve Kerr might want to rest them a bit after the Warriors were a bit sloppy. Green shot an air ball early in the third quarter, and Curry had an ugly turnover later that quarter. The Warriors were 7-of-21 shooting in the third and just 2 of 11 beyond the arc with Curry hitting both 3s.